I never really was physically gone- my computer and I just realized that we were beginning to have an unhealthy relationship with each other. I absolutely LOVE blogging. I am a very late bloomer in the blogging world, but I am trying to catch up. Because I have been trying to catch up (or some people, like my boyfriend, might say I have become obsessed) with the blogging, my space, facebook, twitter, Internet world; I have been spending way too much time there and not in other healthy relationships. So I took a partial break (just for a week). I spent time with friends and family, I rediscovered my love for reading and scrapbooking, and even exercised (if you count going on “really long walks” with my dog exercise). Even though I was taking a break from the computer,I still continued to “eat, drink, and be merry”- so I have a lot of catching up to do with my posts. I have at least four recipes I have to post, at least three restaurant reviews, one cookbook review and I am trying make some changes (I know the word ‘change’ freaks people out, but don’t worry I am just trying to make things even better/cooler/more up to date) to my blog. I love to experiment with premade/box foods. I love taking premade cookie or pizza dough, cake/cookie mixes, and drink mixes to the next level. So the other day I was going through my pantry and saw a cake mix I needed to use up. I wanted to experiment and make something different with it. I then remembered when I was a kid taking a cake mix and making dinner rolls out of it. I deiced to attempt that again. This bread turned out not bad. It has a sweet and savory flavor. I originally made it to eat with dinner one night, but because it was slightly sweet I thought it would be better as a breakfast bread with jam or honey butter smeared all over it. In large bowl, mix warm water and yeast; stirring until yeast is dissolved. Stir in warm buttermilk. Add cake mix and flour- mixing until smooth. Cover bowl with a damp dish towel and let rise until doubled- about one hour. Punch down. 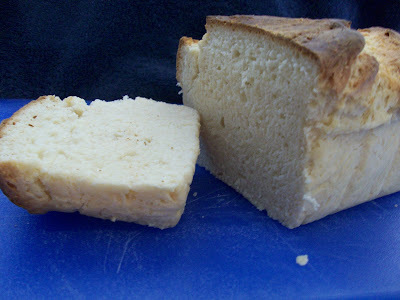 Grease a 8×4 inch loaf pan. Place 3/4 of dough in greased loaf pan. Roll remaining dough into ‘rolls’ and place into a greased muffin tin (If you have a larger loaf pan all of the dough should fit into one pan- it did not all fit in the 8×4 inch pan that is why I also made rolls). Let rise again for one hour. Preheat oven to 350 degrees. Brush melted butter over top of rolls and bread. 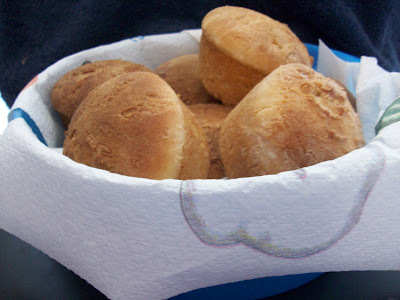 Bake until golden brown- rolls 15-18 minutes and bread 40-45. Cool slightly and serve with butter, jam, or honey.